I must confess to a lifetime’s worth of early morning restiveness, for I too gape after future things and this state is upon me with the first light. I grasp at what I imagine is to come. Accordingly I start my days in error. My mind is no freshly scrubbed tabula rasa. Early. The sun up. The mink is fighting down by the dock. He’s presumably fighting another mink. Me? I wake to the catterwaul and begin making mistakes of the deceiving imagination–being more jealous of action than afraid of knowledge. Oh what the minks and Montaigne have done to me! The first mistake–mine–is to imagine the future. The imagination–mine–is caught in fancies of poor or ghastly outcomes. 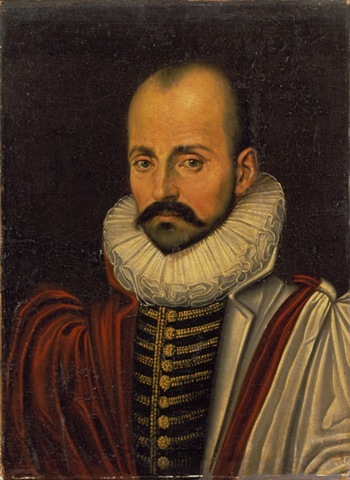 The knowledge that these outcomes never materialize, indeed that my every deleterious fancy has failed to occur does not matter for Montaigne is correct: we are, when in a state of imagination, afraid of our knowledge. Who will imagine a good life? Perhaps Montaigne is also correct to infer that nature prevents us from living restfully in the present. No wonder the apes groom one another. I have no grasp upon that which is to come. Please comb my hair for me. Of course the consolations of Philosophy are meager. Please comb my hair for me. I must tell you that these are my thoughts before I rise from bed. Let the favors and disgraces of fortune stand for nothing. I told you Philosophy was meager. Oh but you should see me when I’m not on vacation. I will not worry today about my graying hair, my bad back, or the compound brutish uncivil qualities of public life. I will advance without a thought by taking a long swim. I have no evidence of Montaigne’s swimming life. Here’s hoping that your tranquility is not disrupted by descending kidney stones like poor, old Michel! Yes. According to FantodPack.com I will be a flightless leather breasted fantod by noon. Oh dear! However will I explain this to the dean? I’m thinking that perhaps what you’re saying is that this morning is not the best time for another charting of your future using the Fantod Pack.